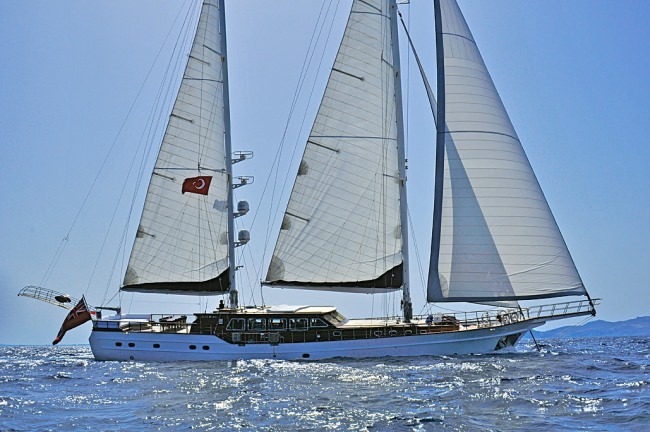 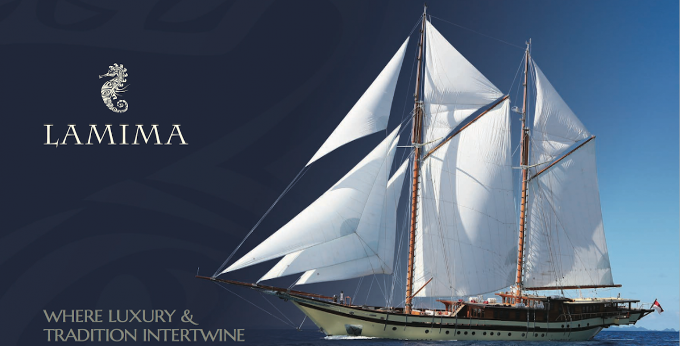 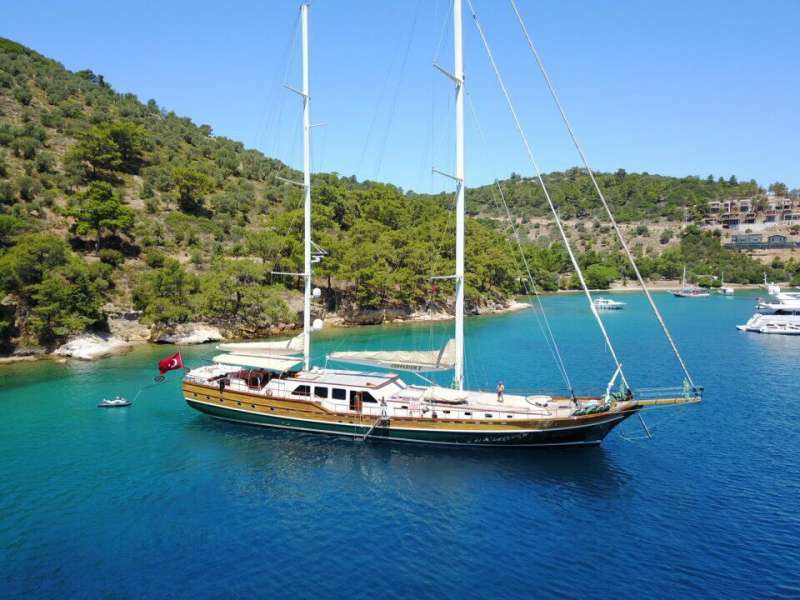 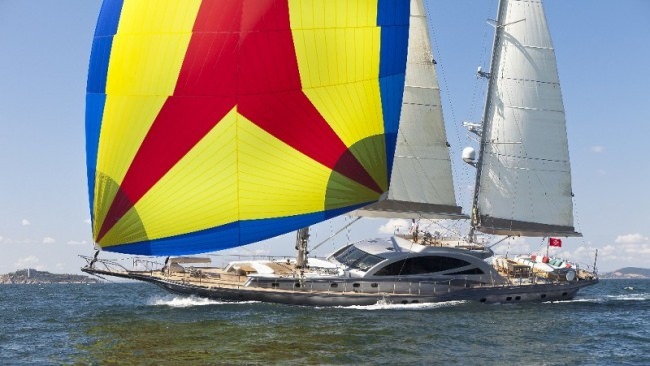 Often referred to as the cradle of civilization, a Turkey yacht charter is both an historical journey spiced with mythological mystery and a stunning encounter of the most vibrantly blue waters in all of Europe. 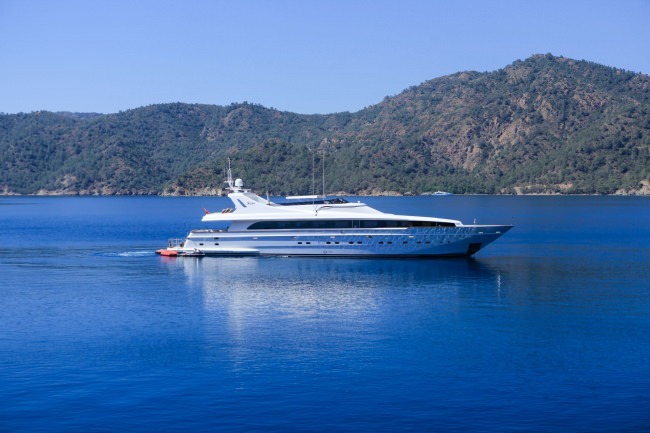 The sea’s extraordinary luminescent quality lends itself to what locals call “mavi yolculuk,” or “blue voyage,” an extraordinary yacht cruising experience. 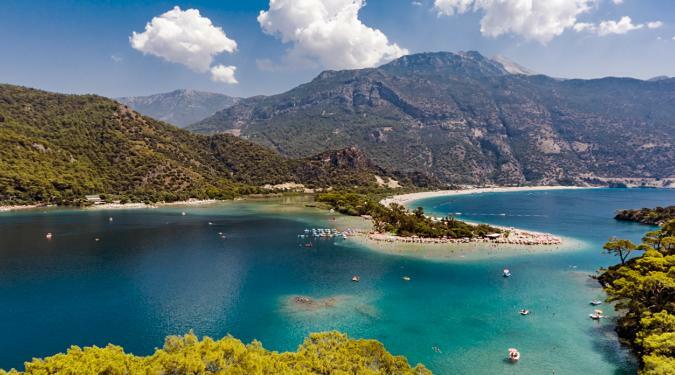 The backdrop of the Turkish coastline is a carpet of pine-covered mountains plunging straight down to meet intensely blue waters and white sand, creating a tableau illuminated by long hours of sunshine. 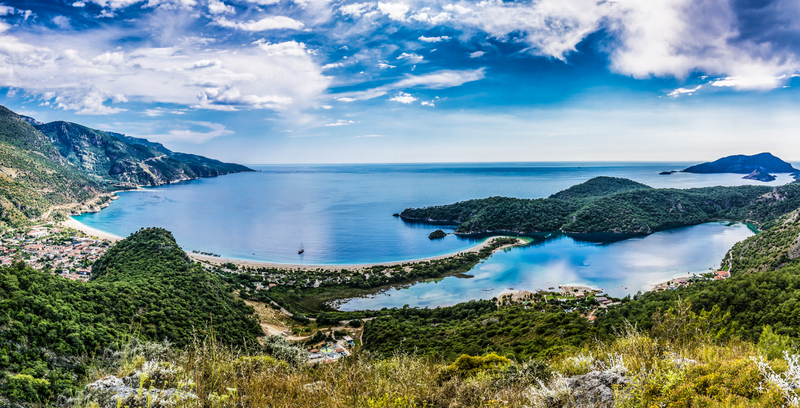 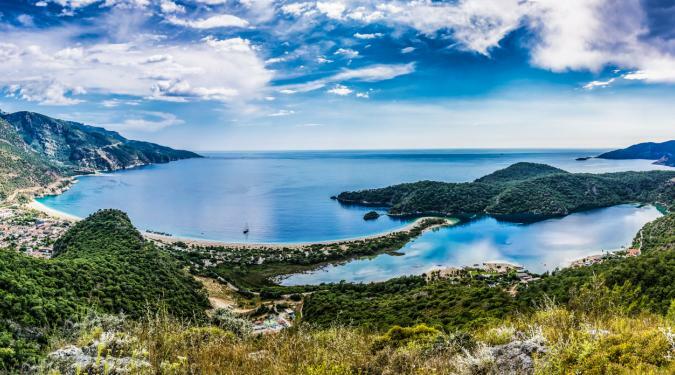 The coast of Turkey stretches nearly 1,000 miles from the azure waters of the Aegean where Odysseus began his fabled journey to the gorgeous Mediterranean Sea. 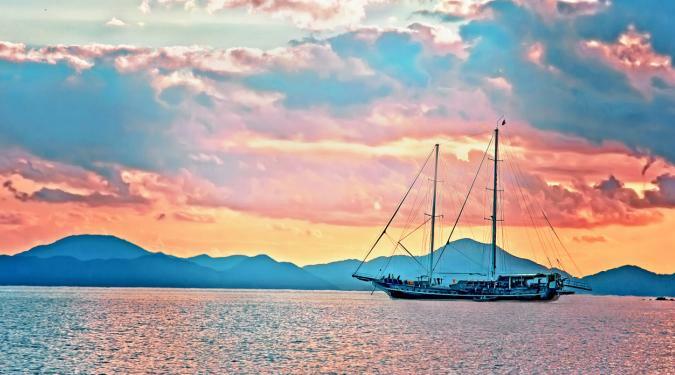 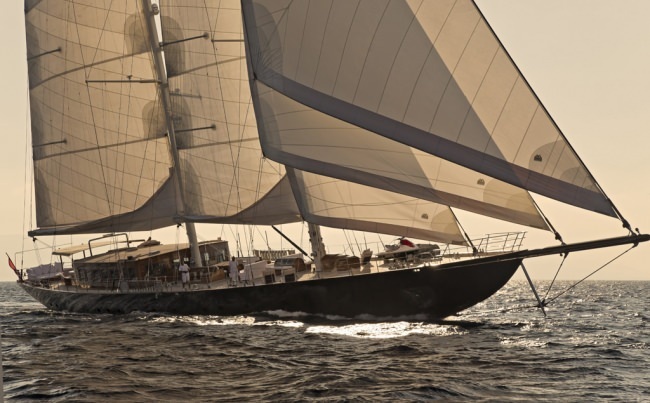 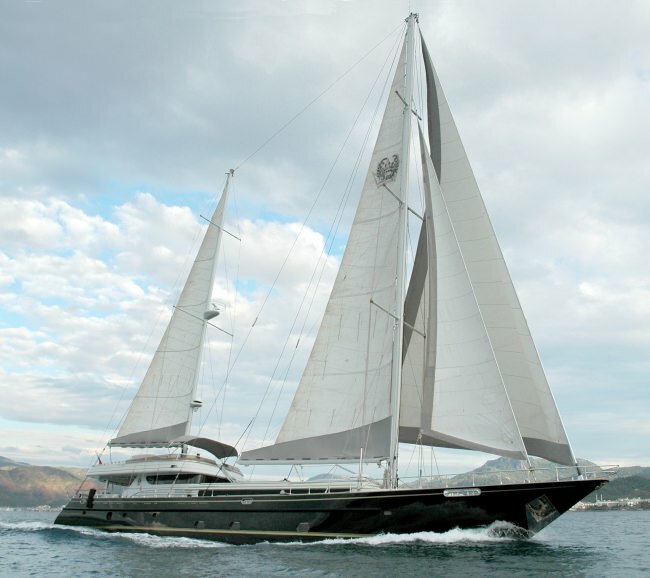 While Homer’s epic poem permitted Odysseus a full 10 years to undertake his legendary journey, we know there’s nothing more precious than your valuable time -- so we craft each moment of your sailing odyssey according to your wishes. 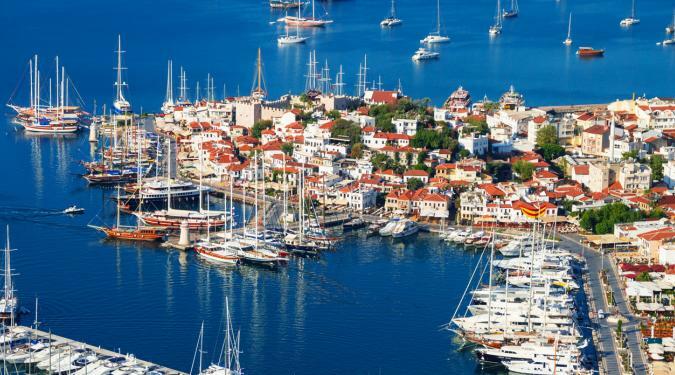 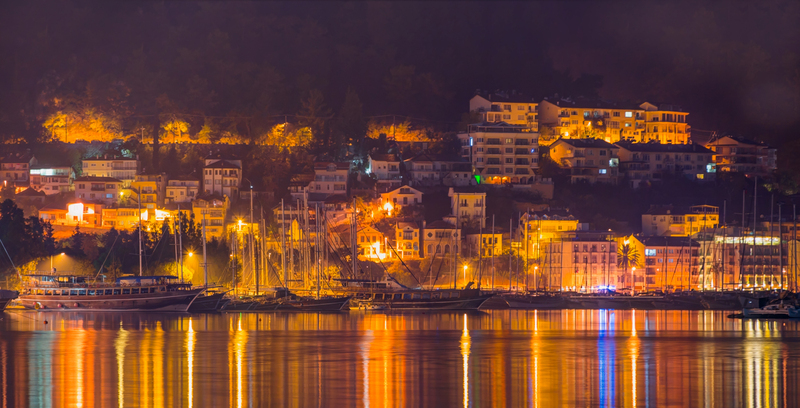 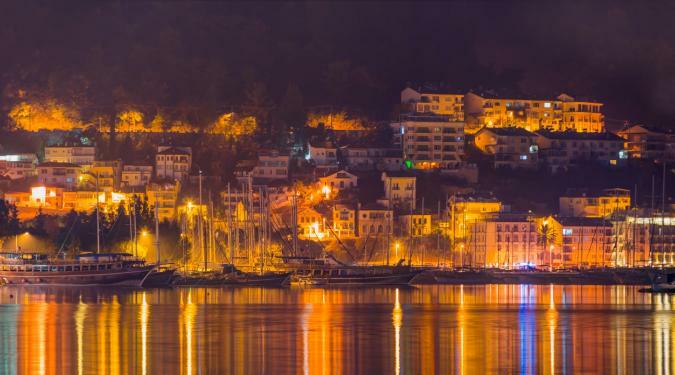 A Turkey yacht charter offers a medley of bustling ports, hundreds of secluded bays, islands where goats are the only sign of civilization, sun dappled picturesque beaches, and sleepy seaside villages. 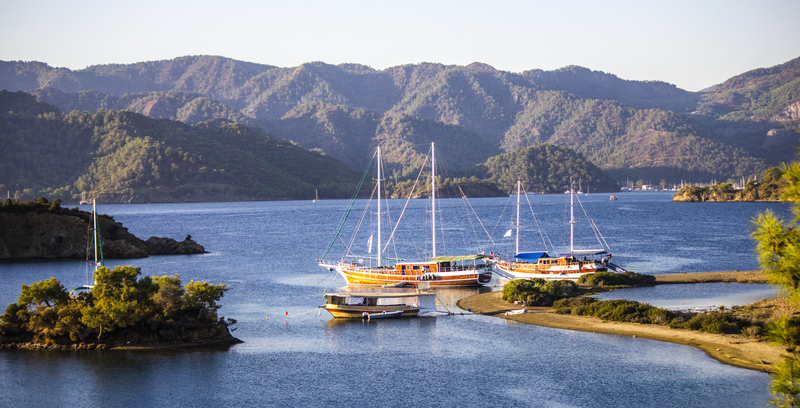 You can beat the tourist track or sneak away for some peace and plenty in a quiet, remote bay. 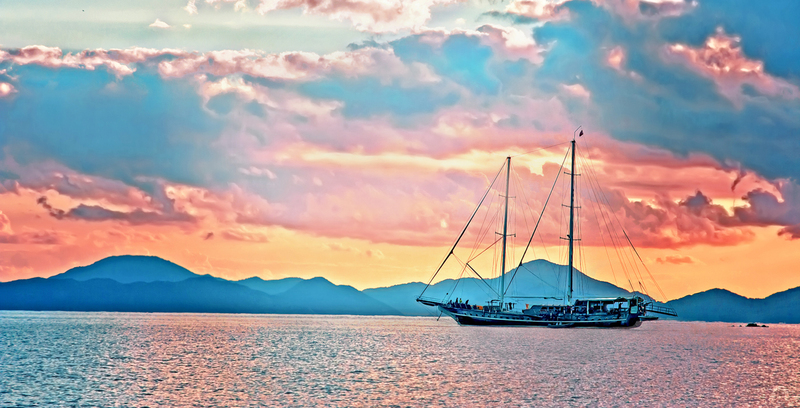 The choice is always yours. 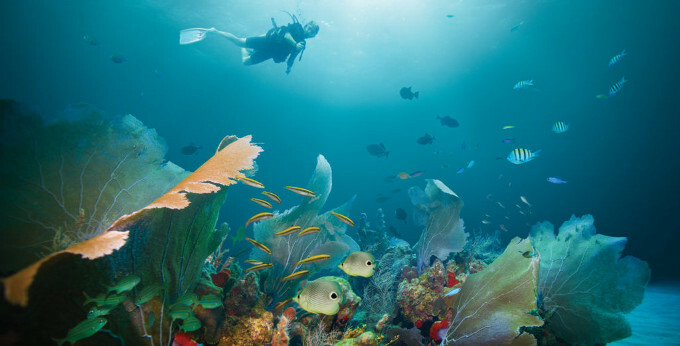 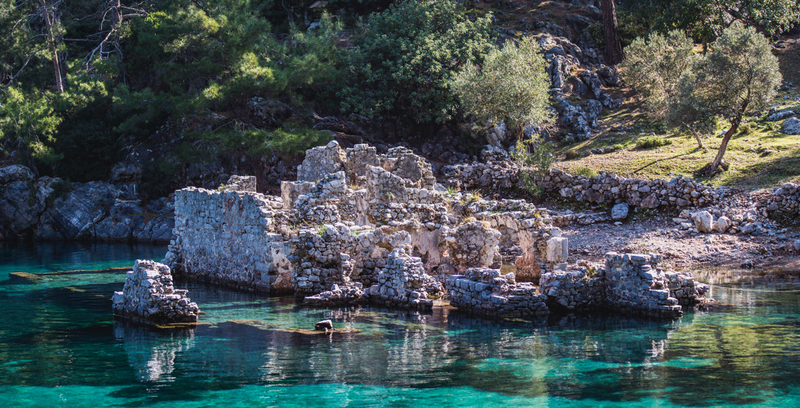 Snorkel over ancient ruins in Cleopatra’s Bay. 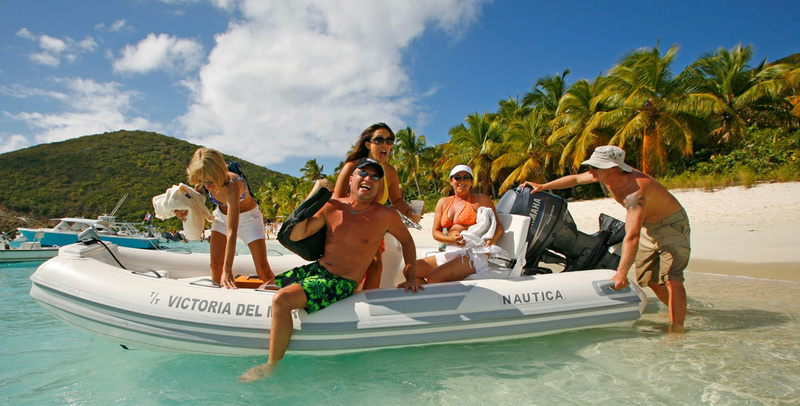 Or crank up the adrenaline as the crew breaks out the waverunners for an afternoon of zooming around the bay. 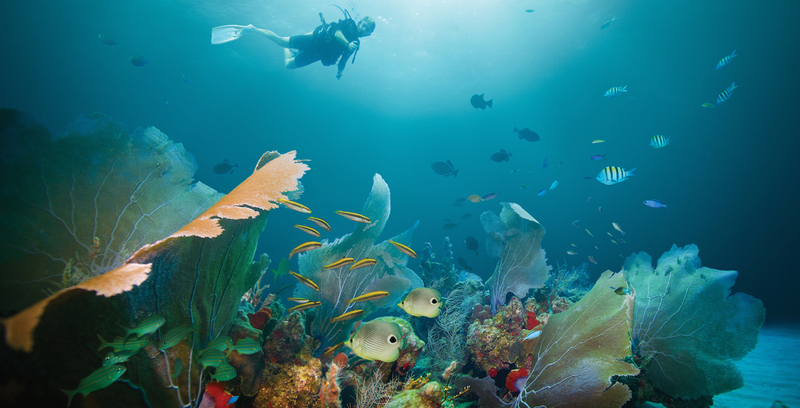 Each day, each moment is a unique discovery. 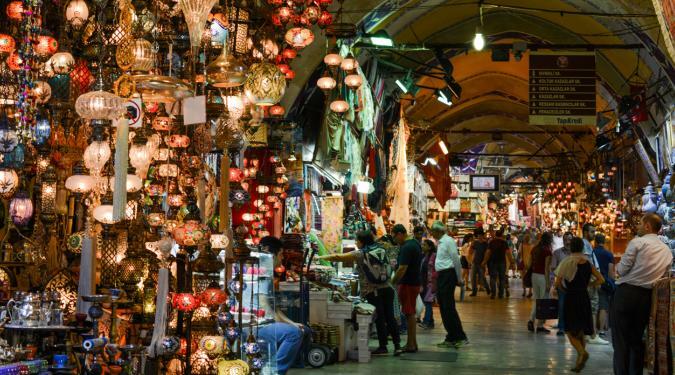 Sip a cup of Turkish tea as you lightheartedly haggle over the price of a carpet, abiding by the unspoken local ritual of never paying full price. 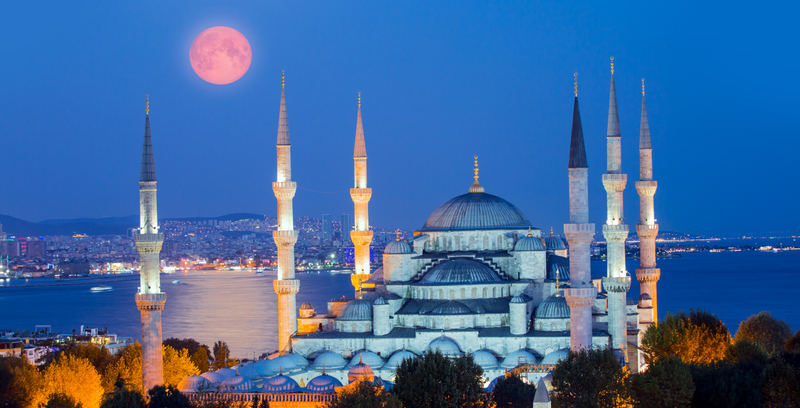 Indulge yourself at a local hammam – a Turkish bath where you are scrubbed, bathed, and massaged in an ancient temple. 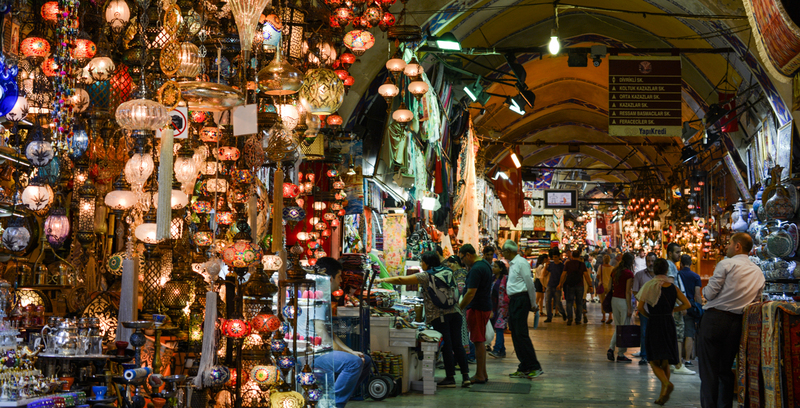 Wander through colorful bazaars and open air markets taking in the scents of turmeric and curry. 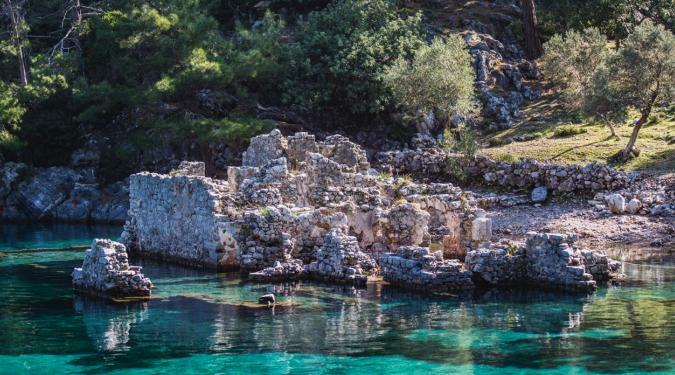 Hike to the crowned ruins of a crusader’s fort. 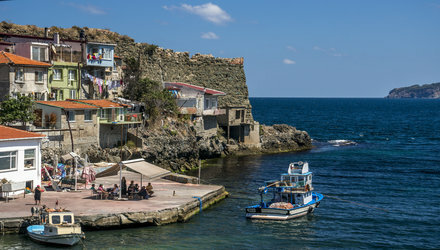 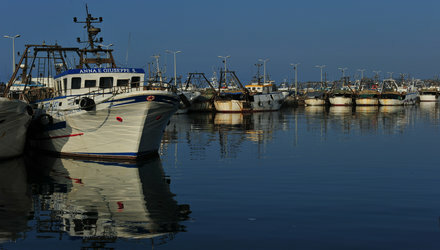 Or simply grab a waterside table in a sleepy fishing village and order a Raki – the anise flavored national spirit. 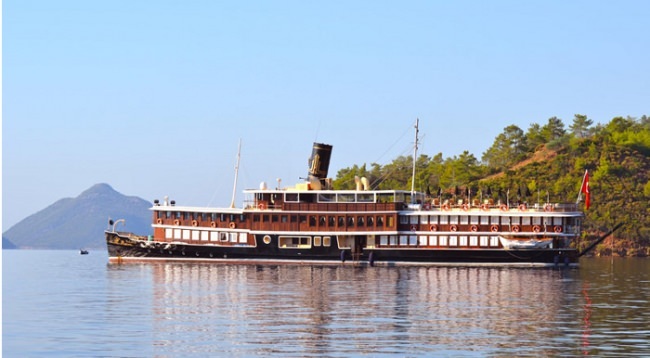 A highlight for everyone is hiring a local guide and river boat to travel the winding waters of the Dalyan River, passing by 4th century B.C. 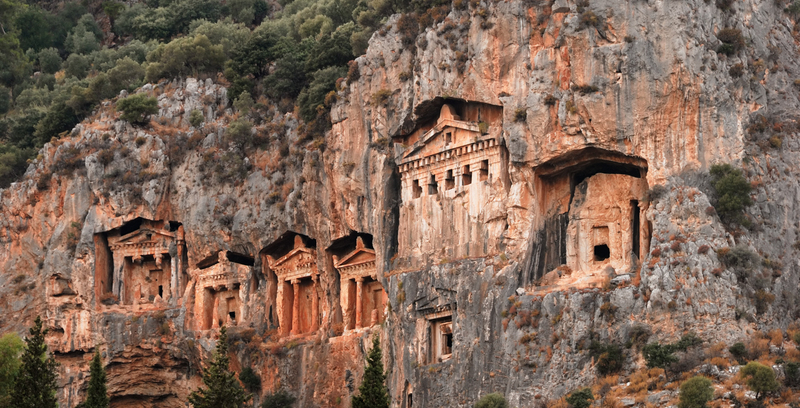 Lycean tombs carved into the majestic cliffs lining the banks, still regarded as an engineering and architectural masterpiece. 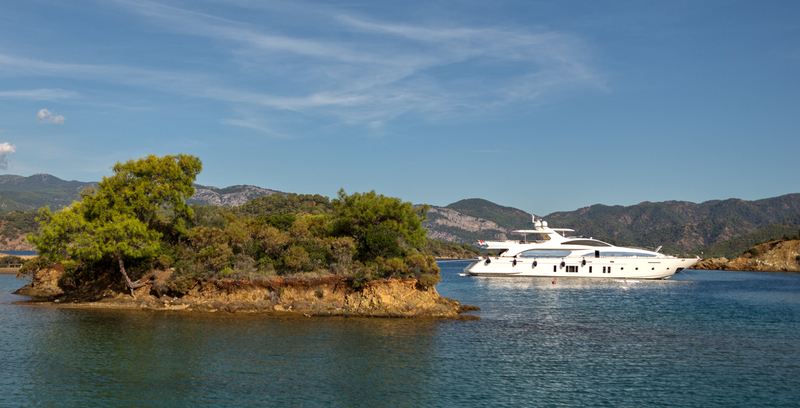 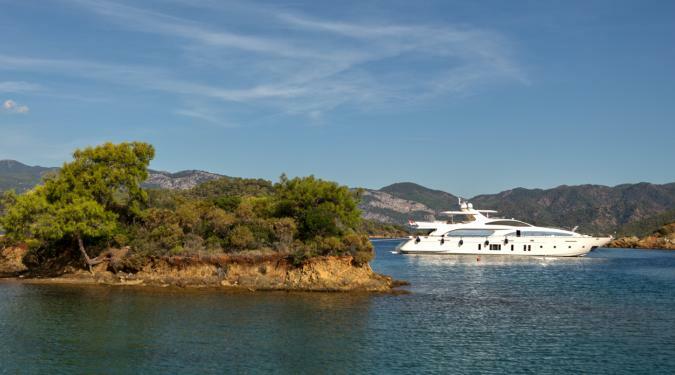 When your senses hit shoreside overload, head back to the oasis of your luxury yacht for a generous dose of carefree relaxation and unabashed pampering. 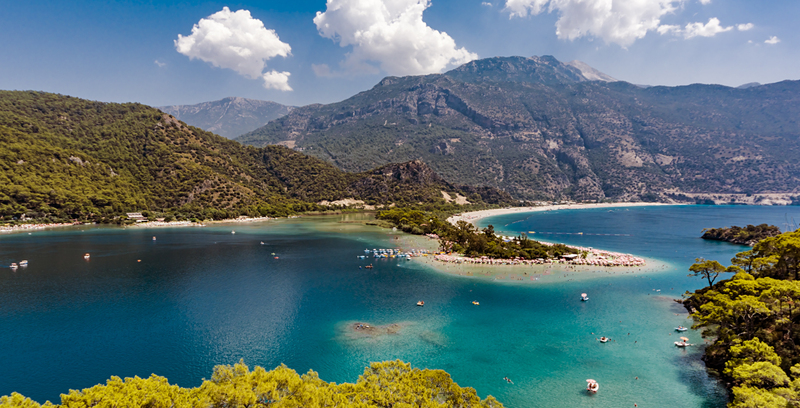 Your chef may be grilling a freshly caught fish infused with Turkish lemon and thyme. 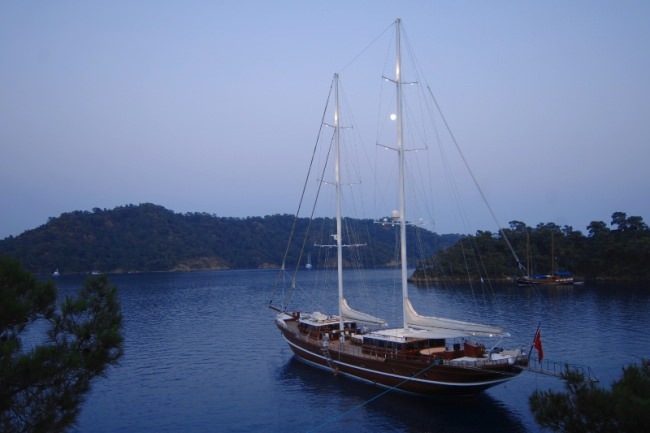 Turkish cuisine was organic long before organic was invented, and the local produce is a yacht chef’s nirvana. 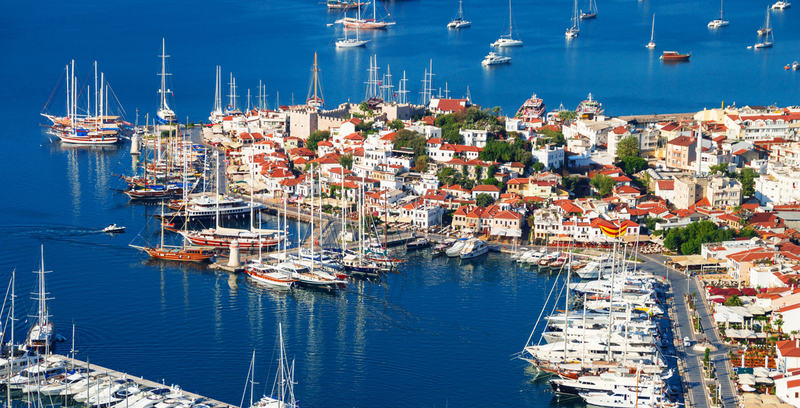 Explore Istanbul on a pre- or post-charter stay over. 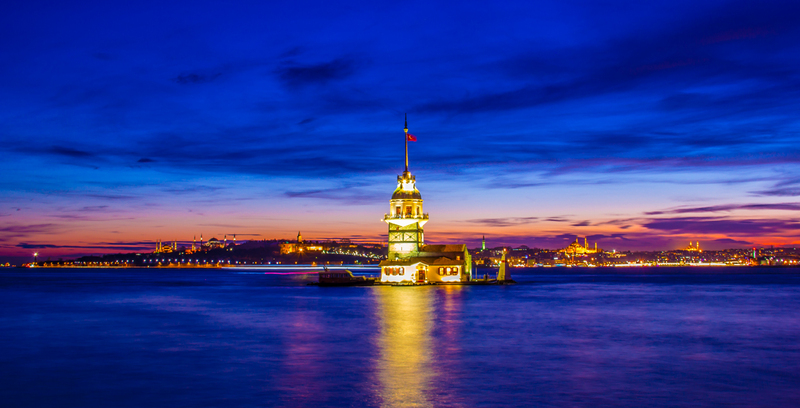 From Byzantium roots, to a Roman rebirth as Constantinople, to Ottoman Empire rule, Istanbul is the bridge between Europe and Asia and the sea route from Black Sea to Mediterranean Sea. 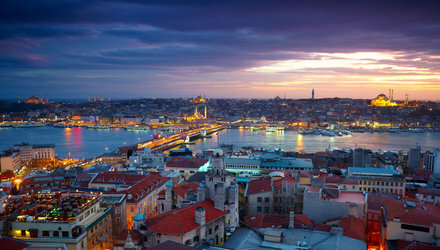 With a stunning ancient harbor at the Golden Horn, the bridge between east and west defines Istanbul. 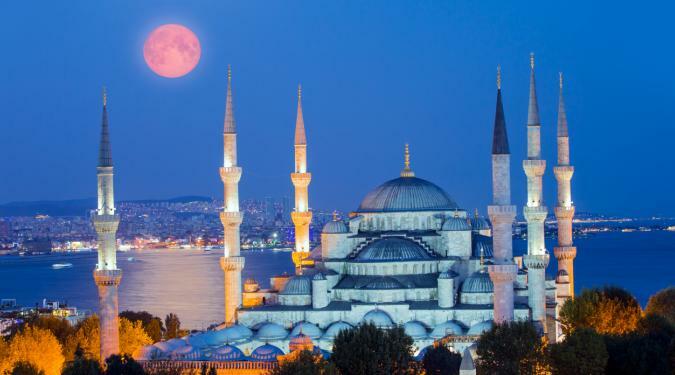 Reflecting influences from disparate cultures, medieval church domes and slender mosque minarets sublimely dot the city skyline on seven hills. 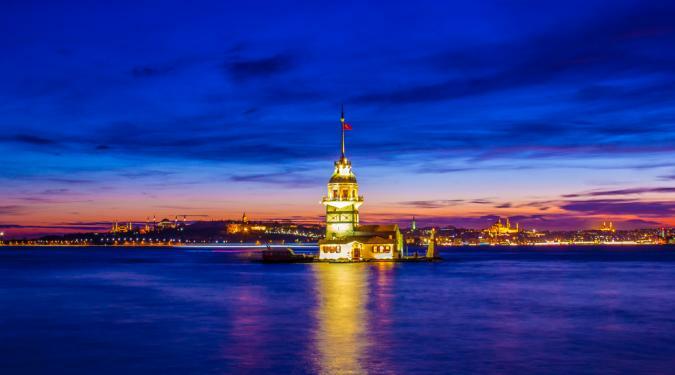 Tuck into some Turkish Delight at the Egyptian Spice Market or Grand Bazaar, take off your shoes to enter the Blue Mosque, tour the underground Basilica Cistern, take a boat on the Bosphorus, and contemplate the Spoonmaker’s Diamond at Topkapi Palace. 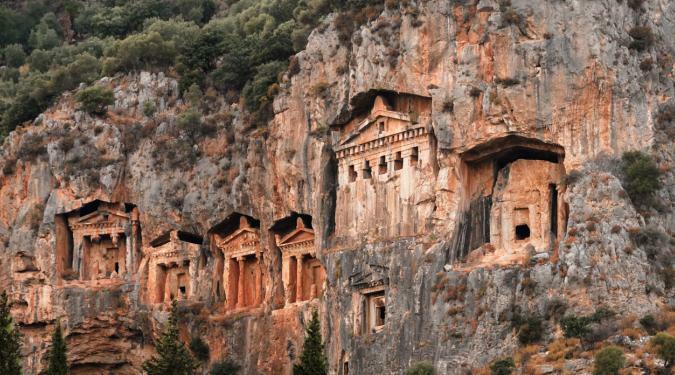 The great outdoor museum of antiquity provides streets of marble, massive remains of the beautiful Celsus Library facade, a huge amphitheater to seat 25,000 and fragments of the original Temple of Artemis, an ancient wonder of the world. 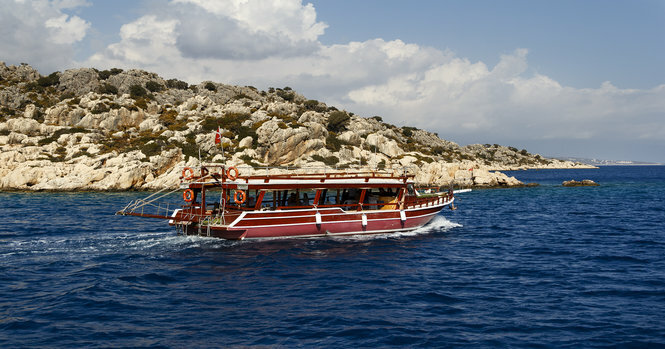 Widely considered the best ruins on the Mediterranean, a few hours at Ephesus opens a window onto the Greco-Roman world. 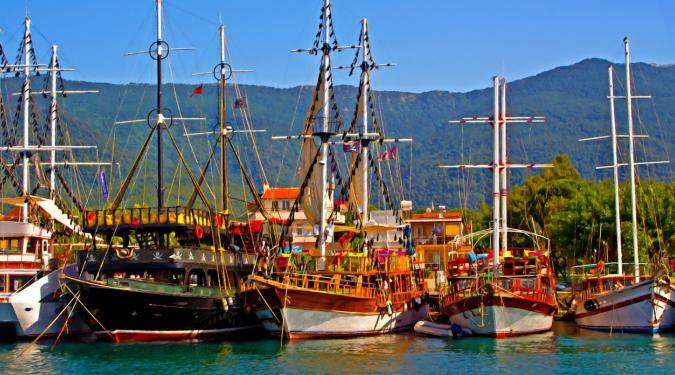 Just eight miles from Ephesus, the port of Kusadasi is the gateway to the Turkish Riviera north of where Marmaris Peninsula introduces the intersection of the Aegean to the Mediterranean. 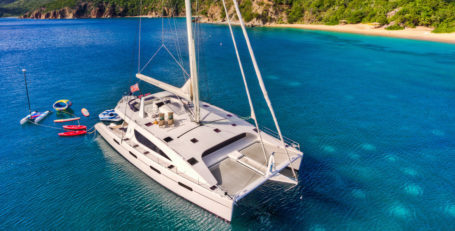 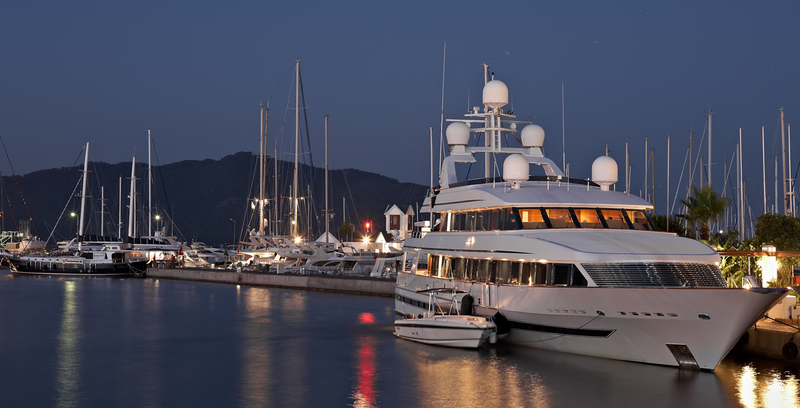 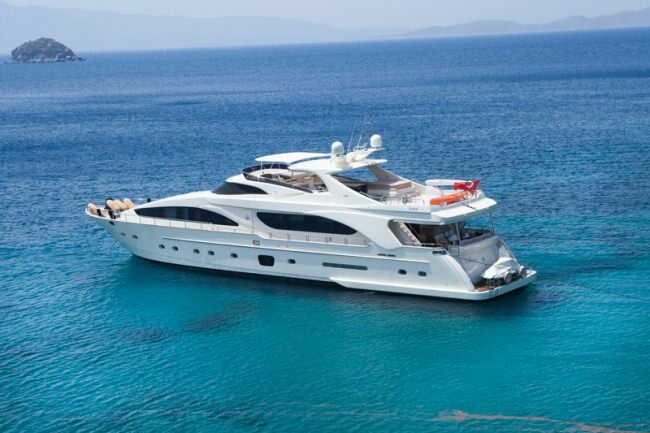 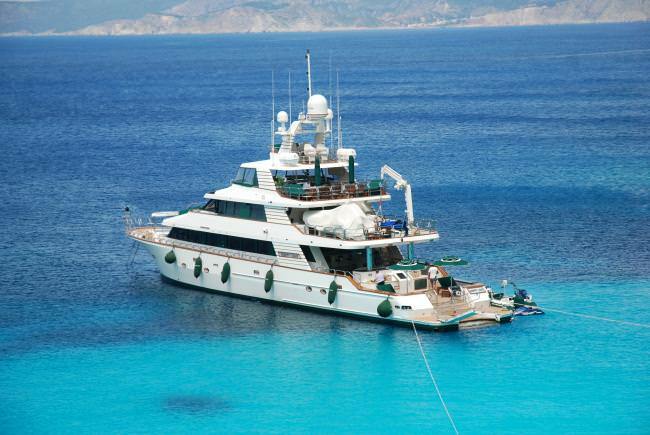 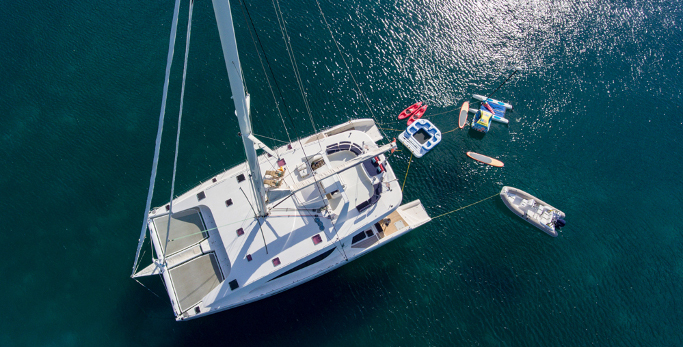 Turkey Yacht Charters can begin a private yacht charter here or along the sought-after coastline between Bodrum and Gocek/Fethiye. 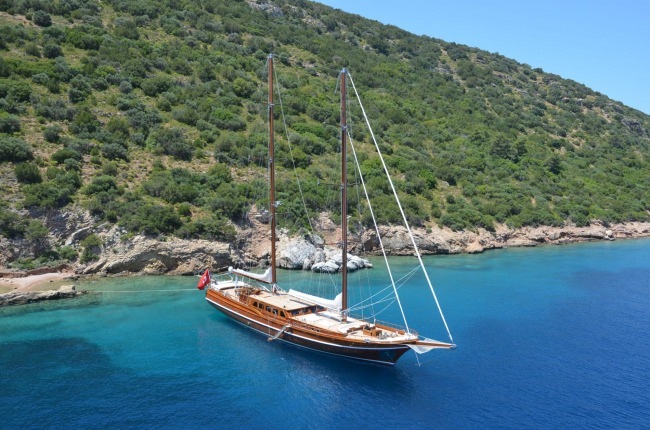 For a full-bodied cultural experience, charter a local luxury gulet with a Turkish crew and vacation in Turkey from an insider’s view. 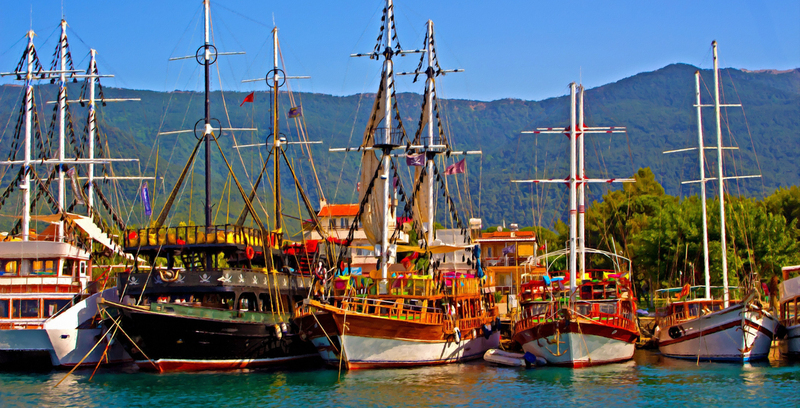 A one-way itinerary between Gocek and Bodrum serves up the many ancient wonders and the mystique of this East meets West destination.